I made these quick and easy Cross cards using Stampin' Up! 's Modern Label Punch for two friends who are each going through challenging times. I was looking for a card design that would fit their circumstances and was inspired by these cards made by Brenda Quintana. For those of you who know me, it isn't a surprise that I decided to "cheng it up" a bit. Actually, I had lost the link and was going off of memory. Well, it turns out that my memory wasn't that great. However, the cards fit each person perfectly and I ended up figuring out my own quick and easy way to punch out the cross. This design also fits many other occasions including Easter. 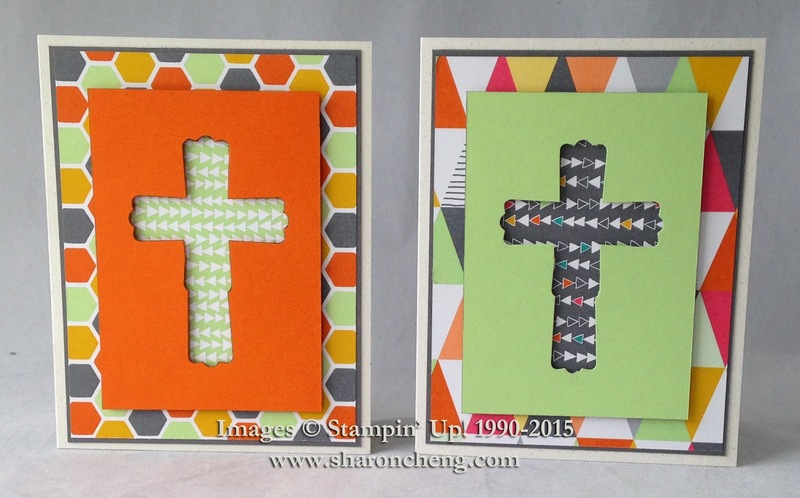 Here is my video tutorial for making the cross using the Modern Label Punch. I also did this video showing how I picked my papers and colors. Several people have asked how I choose my colors and papers for a project. When I plan to use any Stampin' Up! designer series paper, this is the typical process that I follow. However, I realized that I use several tips from one of my quilting instructors to select paper the way I was taught to choose fabrics. I was a quilter before I started with Stampin' Up! 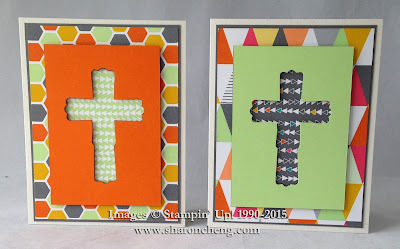 Here are two other projects using paper crosses from my blog. The Dahlia Cross uses an easy version of origami to form a folded paper cross. I combined the Modern Label and Blossom Punches to make this punch art cross.